the technical and practical aspects of music. They would have been familiar with the doctrine of ‘The Music of the Spheres’. According to this, human beings, the earth and everything on it which has material existence, is susceptible to time, and therefore to change and instability. The earth, where the four elements (earth, water, air and fire) are constantly mingling and separating, is at the centre of the universe and is enclosed by perfectly-fitted, spinning, crystalline spheres, each of which has one of the moving heavenly bodies (sun, moon and planets) embedded in its thickness. Outside these is the firmament of fixed stars. The stars are distributed as though on the inner surface of a hollow ball. The firmament is not susceptible to time or change. It is a store-house, not of material things but of perfect forms, free of material existence, in eternity. A human being, by using reason or the soul, may contemplate and observe the eternal. The spinning spheres were believed to produce powerful music, inaudible to most humans, reflected in the earthly 12 : 9 : 8 : 6. A fifth element, the quintessence or ether, was associated with the firmament. It had no substance, but shared some characteristics with the other elements, and influenced them. Among the five established and warranted tunings, bragod gywair was considered to resemble the quintessence, as it shared some the characteristics of the other four cyweiriau. Bragod is a word for a drink of mingled liquids, e.g. ale and mead or the wine and water of the sacrament. In music, the verb bragodi means ‘to flatten’, i.e. to mingle flat with natural notes and thereby to influence the music in profound and subtle ways. Cyweirdannau or ‘I’s approach the nature of eternal things, while lleddfdannau and tyniadau, or ‘O’s, share the nature of temporal things. As the heavenly bodies move and come into changing relationship with each other against the firmament, so the movable strings change their relationship to the fixed strings when we change tuning or play cerdd dant, with its varied figuration and changing harmony. 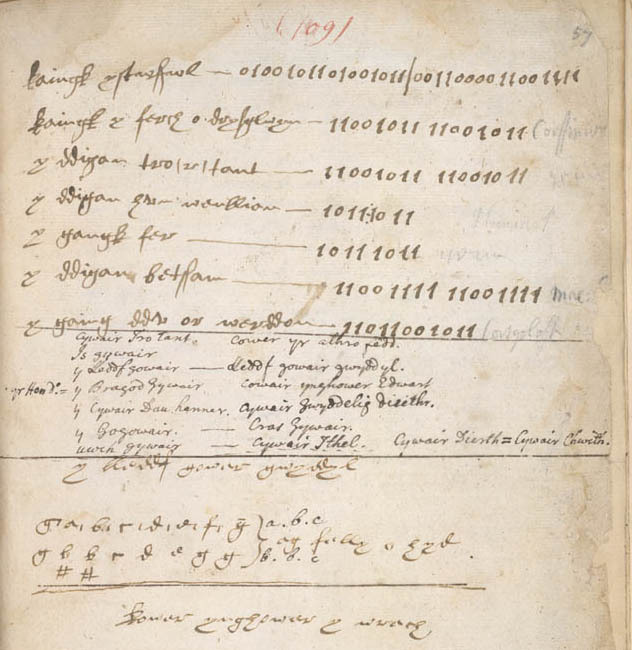 Detail of p. 109, Robert ap Huw MS, showing a list of cerdd dant titles with their mesurau in binary notation, notes in the 18th century hand of Lewis Morris and a tuning chart showing y lleddf gower gwyddyl. To memorise, understand or create a piece of cerdd dant, the harper or crwth player had to know which of the twenty four mesurau, patterns of ‘I’s and ‘O’s, underlay it. He also had to know which of the five cyweiriau or tunings to use. By combining notes drawn from both ‘I’s and the ‘O’s to make different kinds of figuration, the musician was able to create new, individual pieces of music. The cywair was set for the whole piece and roughly equates with clefs, which, in staff notation, included signs for flattened notes. The mesur was relatively stable but might change once or twice during a long piece of cerdd dant. Mesur or measure was roughly equivalent to indications of time in staff notation. Clefs and signs regulating musical time were placed at the beginning of the stave and known as ‘external’ musical signs; denoting sameness. The signs for different kinds of figuration in cerdd dant are roughly equivalent to neums or to ligatures in later medieval staff-notation and to signs for different note values, distributed along the stave. Instead of Robert ap Huw’s letter-names for strings, the vertical positioning of the notes on the stave indicated pitch in staff notation. Ligatures were single signs, combining information on pitch and note-length, representing figuration. These were all ‘internal’ musical signs; denoting difference. Cerdd dant was the interplay of the same and the different made audible.